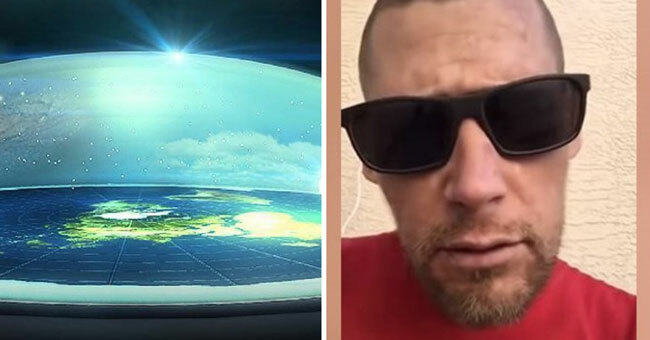 A member of the Flat Earth Society, who goes by the name of Flat Out Hero, has offered $100,000 to anyone who could offer him solid PROOF that the Earth isn’t flat. Flat Earther Society is basically a society based on the belief that the Earth is actually, in fact, flat, despite every piece of scientific evidence that proves that it is not. In the video, he called out on a person in particular, YouTuber Wolfie6020 as he laid out grounds of his challenge. He asked Wolfie to use flight charts to navigate a plane from Point A to Point B and from Point B to Point C, before heading back home, all the while making sure that the exact same distance is flown between each point and that only 90 degree turns are made. Sounds pretty fair, right? In his own video, which was titled ‘This Flat Earther Owes Me $100,000’, YouTuber Wolfie6020 shared the exact flight path which 100% fit the requirements of Flat Out Hero’s challenge. But it turns out that Flat Out Hero didn’t actually intend to use the word ‘chart’ as a verb! So apparently, there’s some mistake. Flat Out Hero also didn’t want electronic charts to be used, tsk tsk. This prompted Wolfie6020 to upload another video to comply with the requirements, showing this time with flight paths that could be mapped out on paper. Eventually, Flat Out Hero did admit that the Wolfie6020 had managed to successfully plot out the route. BUT, he didn’t believe it was possible to actually fly it that way. Thus, he would not be paying out because he STILL didn’t think it had been proven that the Earth was, in fact, flat. Thousands on the internet have been following this YouTube feud playing out over the past few months. Some suggested that, well, Flat Out Hero may not have the necessary cash to pay out after all. So, there’s that too.